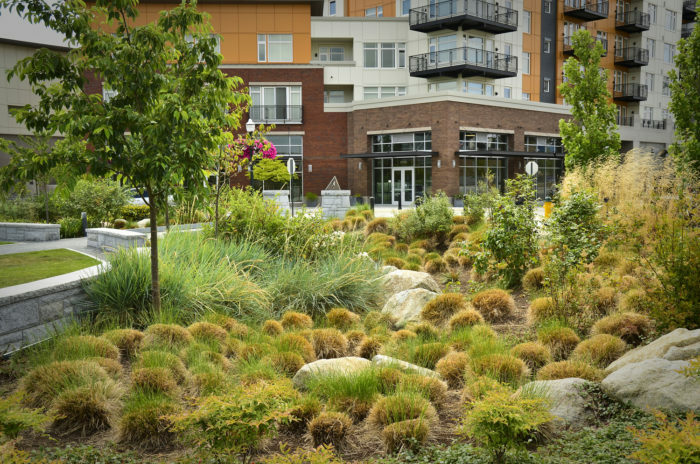 Raingardens: Landscaping features that collect, absorb and filter stormwater runoff. Typically, a raingarden is a shallow, bowl-shaped depression containing compost-amended native soils and adapted plants. However, raingardens come in all shapes and sizes. Other Green Infrastructure: Other forms of Green Infrastructure that effectively manage stormwater by mimicking natural processes, and that can facilitate student learning. Examples include: rain barrels/cisterns, trees to increase canopy cover, green walls, green roofs and permeable pavement. Off-Site Green Infrastructure: A raingarden (or other form of Green Infrastructure) located at a nearby park, within safe walking distance of a school. Metro Parks Tacoma is open to collaborating with neighboring schools to provide access to raingardens on park property.